After a 4+ hour wait in the border town of Hidalgo for a taxi to become available, we finally made it to Tapachula after 7pm. Here you see the Suchiate River which we crossed yesterday and the town of Hidalgo where we waited so long for our taxi. 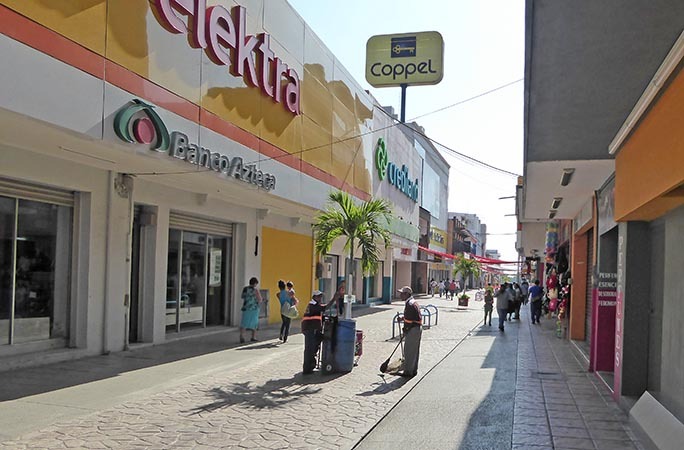 Tapachula was far bigger than we expected, and far more modern. It was a very pleasant surprise. 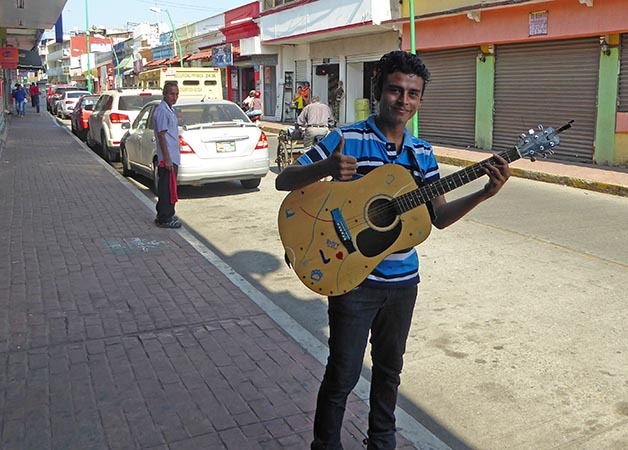 Music on the street is a very prevalent sight in Latin America. These guys were great! 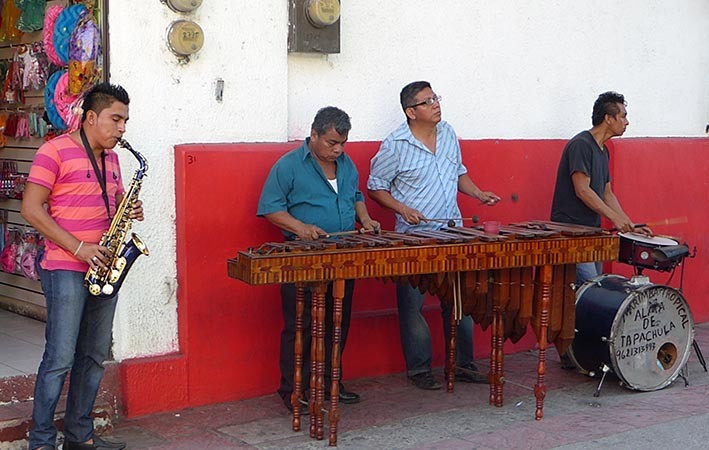 The usual marimba band generally consists of only marimba players. Sometimes four people will play on one large marimba, or there might be several marimbas with players dueling it out. It's a lighthearted tropical sound heard all throughout Latin America and some of the surrounding islands. This band, however, had the addition of drums and a saxophone player which added dimension and the sound generated was more modern and universal in appeal. Snacks of fresh fruit and fried crispy selections abound. The tropical fruit is something one gets used to here in these latitudes - Papaya, mango, watermelon, cantaloupe, honeydew, strawberries, and various local choices. All amazingly sweet and bursting with flavor and fragrance. These are served "natural" or with sliced lime and chili powder, or with lime and honey. We caught this happy street musician and took his photo. 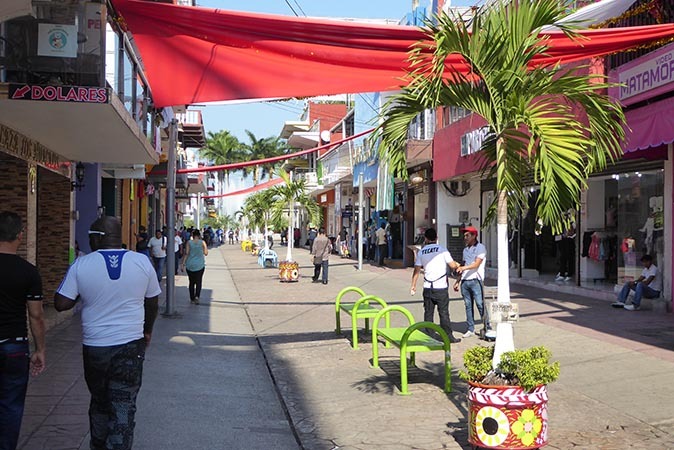 Notice that the city is very clean, and that the sidewalks are fairly wide and not broken making walking much easier than in many small villages. A Chinese restaurant in every town! 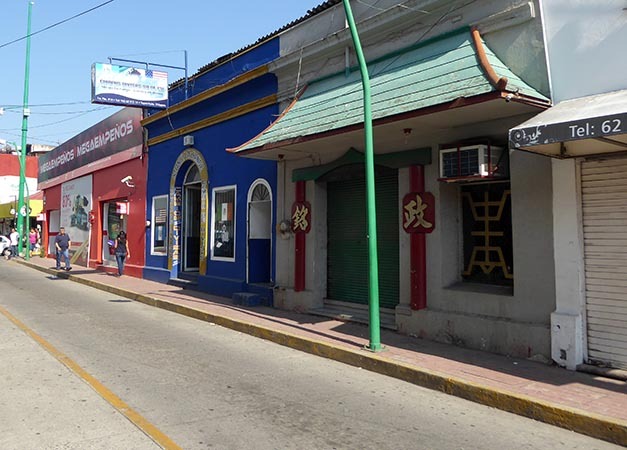 We noticed lots of Chinese restaurants in Tapachula. 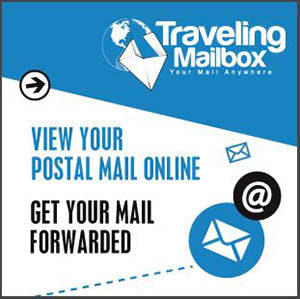 In fact, there is probably no town in all of our world wide travels that doesn't have one. 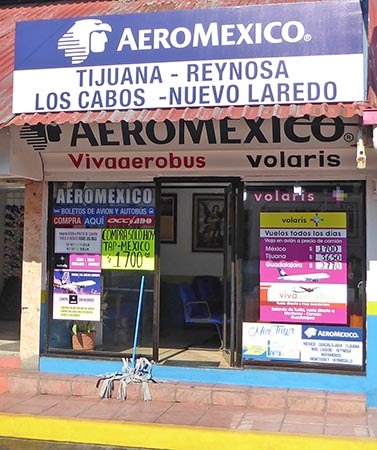 The airlines used in Mexico are AeroMexico, Interjet, Volaris and Vivaaerobus. 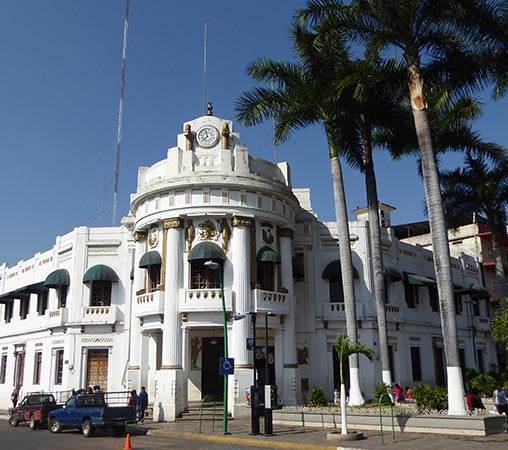 Tapachula has an international airport which makes world travel easier. 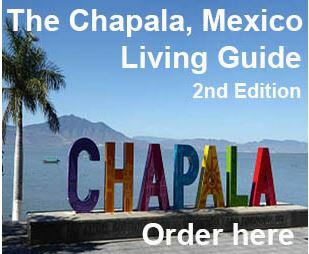 We'll be flying in country from Tapachula to Mexico City one way for less than $50USD each. There were lots of areas for shopping and many walking streets where cars were not allowed. Notice the sidewalks and streets are all one level, making it very easy to walk without tripping on a rising curb. This shopping area had benches for sitting, more greenery to give a break from the concrete, and colorful pots for the palms. 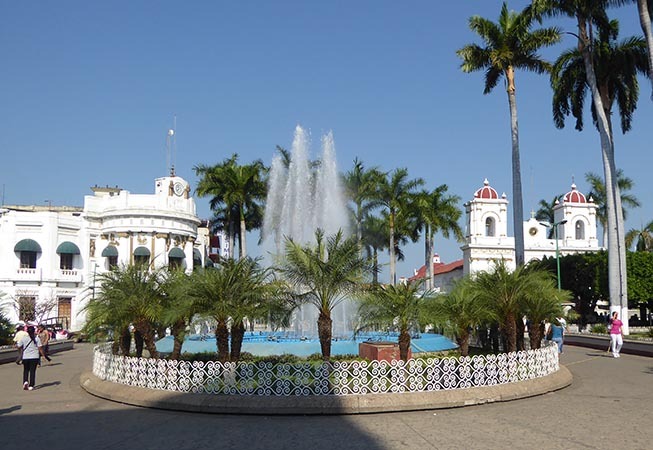 At the end of one of the walking/shopping streets was this beautiful fountain and several well kept buildings. The outside of this building is beautiful and well kept, but the inside is under construction. It will eventually become a City Hall and a cultural museum. 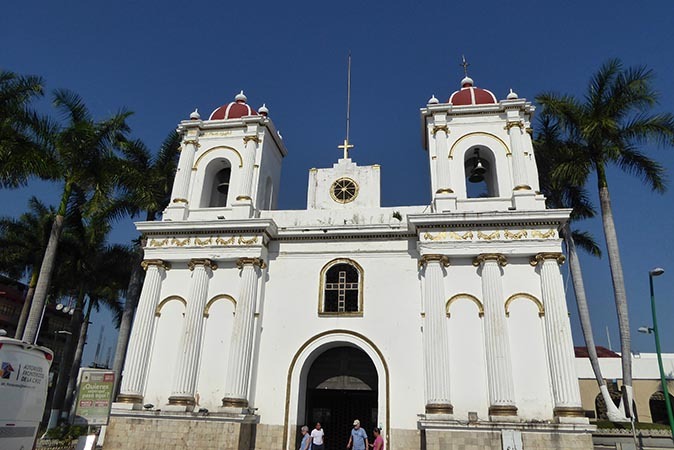 It is traditional to have a Church on the city or town's Plaza area. In fact, all through Latin America, if there is a Plaza, most likely there will be a church as well. 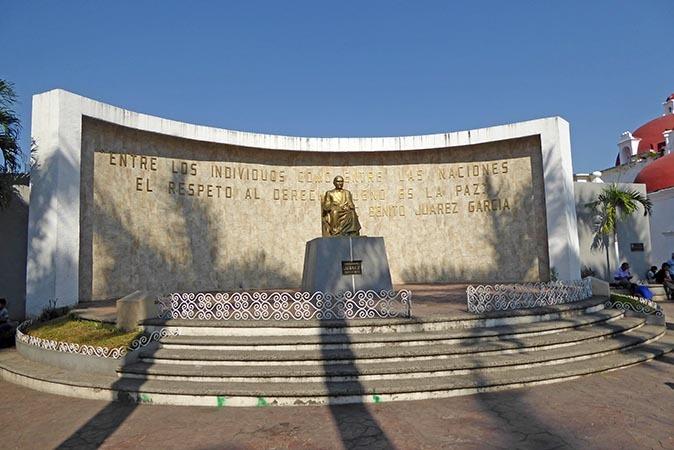 Benito Juarez was a lawyer and politician from Oaxaca who served as Mexico's president for 5 terms. He died a national hero in 1872. 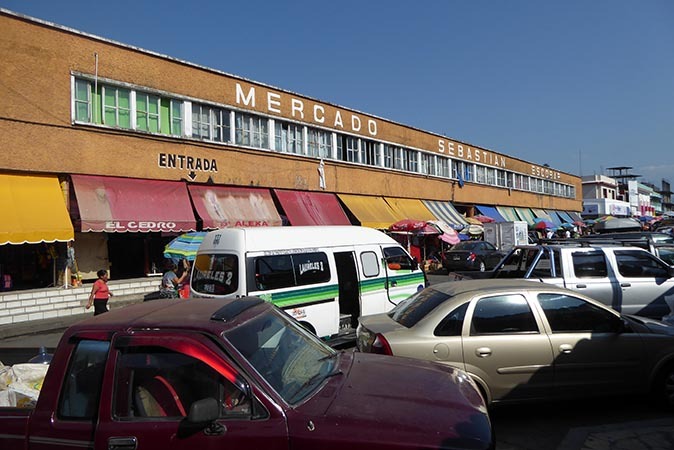 Mexico will often have 2 styles of markets. One like a modern grocery store with wide aisles, refrigeration, and a super store selection. The other style of market is more like a farmer's market with individual stalls selling meats, poultry, fish, vegetables and fruits. There could be hot meals available as well, liquado stands, and possibly jewelry, music and movie CDs, sports clothing and backpacks. The market shown above would be the farmer's market style. 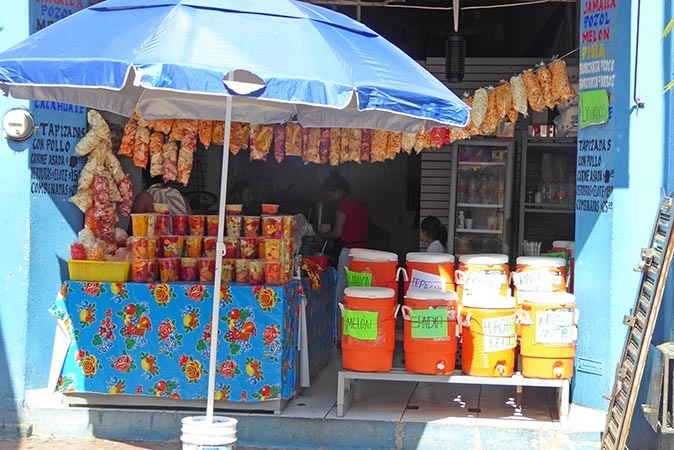 Individual stands are everywhere in Mexico. 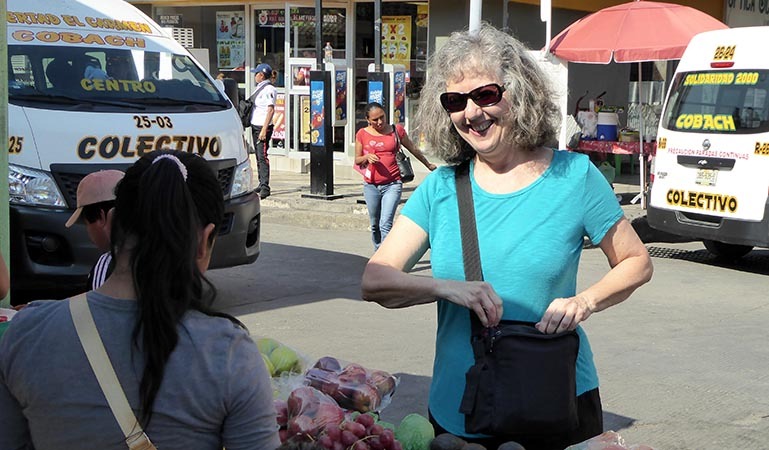 This woman is selling fruit and I purchased several bananas for 5 cents each. Here you see some individual businesses selling meals inside a market area. Most places sell pretty much the same thing as the next place, but perhaps you like the spices that one person uses or you might know the owner and choose to patronize them over someone else. 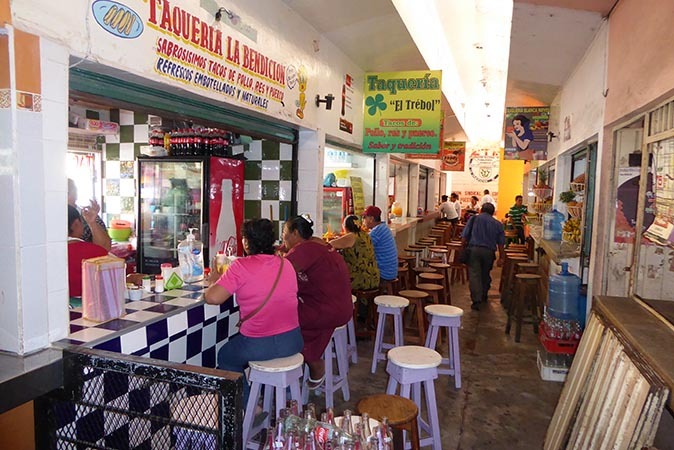 These places, rather than traditional restaurants are more affordable and appeal to the local people. Here we are on this sunny morning walking around town. The government building, soon-to-be-City Hall is behind us past the fountain. 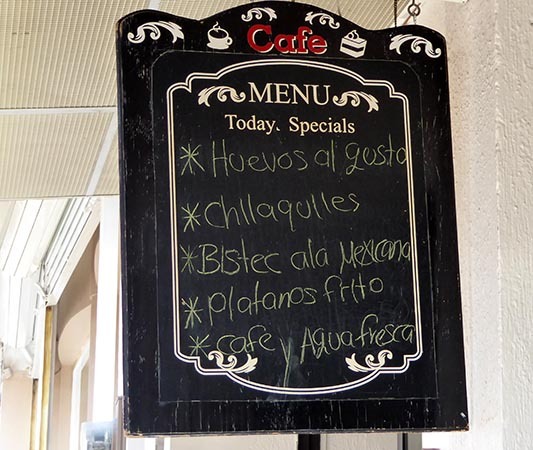 Today's specials are Eggs any way you like them (including Huevos Rancheros), Chillaquilles which are a fried tortilla covered with red sauce and some morning cheese, Beef steak with a sauce of tomatoes and onions, Fried bananas and coffee or fruit water drink. Fruit water is a combination of fresh pure water, sugar and bits of fruit whirred around in a blender. It is lighter than a liquado (we would call them smoothies) and less filling. Agua fresca can also be a potent deep red tangy tea made from hibiscus flowers called jaimaica (huh-MY-kuh) or a drink made of rice, sugar and cinnamon called horchata. A good horchata, with a sprinkling of cinnamon, is exquisite. Jamaica is packed with vitamin C, and if not too sweet, can be very refreshing. 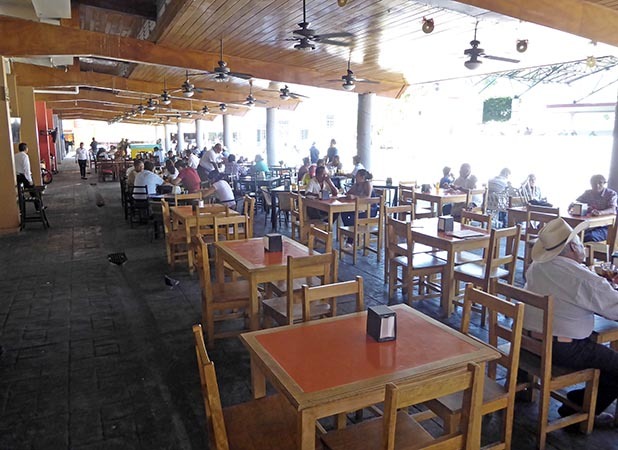 After ordering your meal you can sit down here under the roof with an open air view of pedestrians walking around the Plaza. The weather, even in mid-winter when we were there was mild, sunny and very pleasant. Notice that people are in short sleeves with no jackets on. Yeah... I always wanted to be a trophy wife, haha. We stopped by a sporting goods store and we saw these trophies along the wall, and I said to Billy, "I can be a trophy wife! Take my photo next to one!" 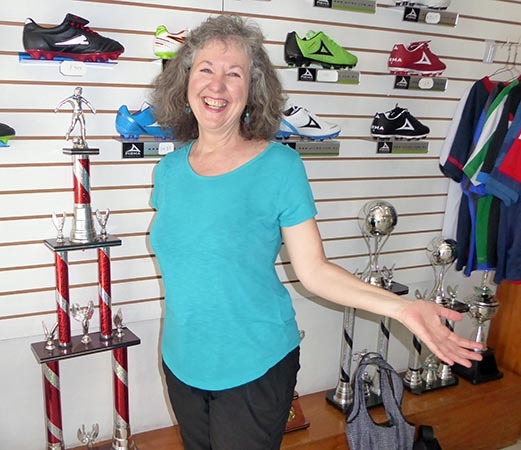 We walked into the store, and I spoke to the manager, explaining my wish to be a trophy wife, and could we please take a picture of me next to one of his trophies? He just laughed and spoke back to us in English. We chatted for a while and he explained how he used to work in the U.S. years ago for an international company, and that is where he learned his English. 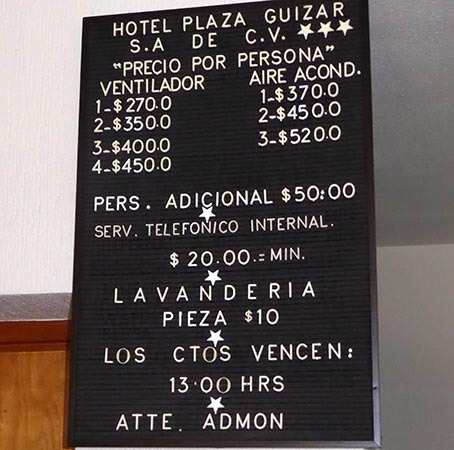 These are the prices of our hotel in Tapachula, Mexico. 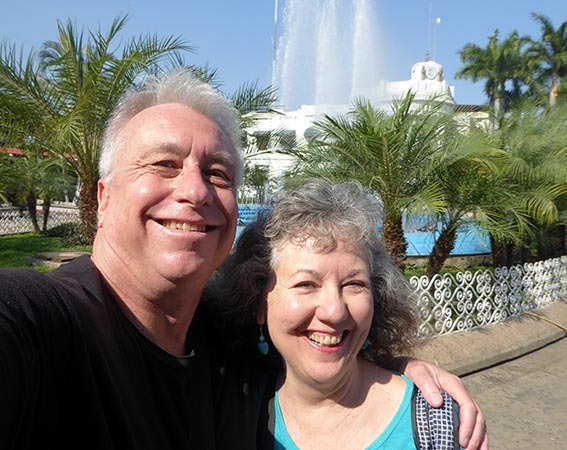 We stayed at Hotel Plaza Guizar, centrally located right in town next to the walking street and one block to the park and Mercado. For our air conditioned room we paid 450 Pesos a night, about $22.50USD at this time. 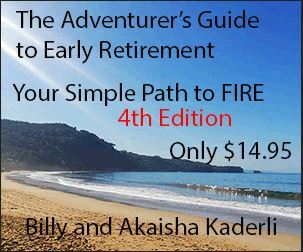 With the Mexican Peso hovering around 20+Pesos per US Dollar, Mexico is on sale right now, and we are enjoying the savings!